SHROFF is one of the predominant Manufacturer, of a huge assortment of Rubber Products and Components. Our products range includes Industrial Rubber Bellows, Rubber Expansion Joint , Double Arch Rubber Expansion Joints, Multiple Arch Rubber Bellow , Rubber Diaphragms, Rubber O-Rings. Our range is designed in accordance with international quality standards and norms, using premium grade raw material. In order to attain utmost customer satisfaction, we also provide customization as per the specifications detailed by the clients. Flange Type Rubber Expansion Bellow Can be supplied with MS or SS Backup flanges ( Retainer Rings ) & Controll Unit - Tie Rods & fasteners. 2008-09 Upto Rs. 50 Lakh. Established in the 1975, We, SHROFF PROCESS PUMPS are one of the renowned manufacturer, exporter, supplier & service provider of a wide range of Chemical Process Pumps, Slurry & Sludge Pumps, Non Clog Self Priming Mud Pumps, Rubber Diaphragm, Rubber Expansion Joints, Rubber Bellows, Rubber Lined MSRL Tanks, Pipes & Fittings, Rubber Lined Diaphragm Valves & Non Return Valves, Rubber Spacers & Slitter Rings. We also provide Rubber Lining Services at our workshop & at client site. Our products & services are highly appreciated for innovative features also corrosion and abrasion resistance. Owing to these features, our products are widely used in Chemical Industries, Power sector, Dyes, Textile, Pharmaceuticals, Cement, Plastic, Paper, Petrochemicals, Mining, Coal, Fertilizer and many other Industries. 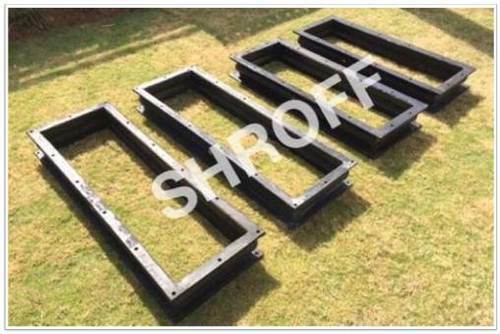 The pumps & bellow joints are sold under our famous brand name SHROFF and are manufactured as per the needs and requirements of our clients. We have a manufacturing unit, which is well equipped with technologically advanced machines and equipment. Our machines are operated by expert professionals to ensure smooth production. Further, our team enables us to produce our entire range of pumps & products as per the industry norms and standards.